Nine years after Paul Gardner and Julie Rennie opened Pentâge Winery, they finally are close to opening a tasting room as well. In fact, the city of Penticton had a sign up in July, prematurely, directing visitors to the new access to the winery. The entrance is at 4551 Valleyview Road. Until now, the winery address was 4400 Lakeside Road. Paul and Julie had considered, briefly, putting the tasting room and wine shop into or near their home, which is below the vineyard. That idea was vetoed, in part because getting there requires driving up a long and steep driveway. The Valleyview Road access is easier. The tasting room has a better location at the top of the vineyard. The view over the vines and Skaha Lake is dramatic. The tasting room also is next to the remarkable 5,500 square foot cellar that was recently completed at Pentâge. It is a cool man-made cavern dug from the rock, with a thick concrete lid. The huge glass doors at the front, which roll up like aircraft hangar doors, give visitors good views of the barrel stacks inside. Recently, Adam Pearce, the Pentâge winemaker, led me through a tasting of some of the wines in those barrels. After that, I came away with review samples of the current releases. Adam was about the bottle several of the wines. There is a 50-case barrel-fermented Rhone blend (57% Viognier, 36% Roussanne and 17% Marsanne), an appealing wine with aromas and flavours of apricots, melons and citrus (90 points). There is a 50-case barrel-fermented 2009 Chardonnay, with a good core of butter and tangerine flavours and an appealing aroma of citrus and butter. (89). The barrel sample of the 2009 Cabernet Franc is a lively wine with flavours of blackberry and raspberry and with a little more concentration that the 2008, reviewed below. (89). The winery has 200 cases of 2009 Syrah Reserve, not yet released. It is a classic meaty, gamey Syrah with the peppery aroma of a delicatessen and with flavours of plum and black cherry. The rich texture adds to its appeal. (90). Also not yet released in the 2009 Hiatus, a $20 blend of Merlot, Cabernet Sauvignon and Cabernet Franc. This is an easy-drinking Bordeaux blend with flavours of black currant, with notes of cedar and tobacco. (88). Other gems in the cellar include a 2010 Malbec, a 2010 Petite Sirah, a barrel-fermented Icewine and 2010 Zinfandel port. There are small quantities of all these wines; and all rate 90 points plus. If this seems like a long portfolio for a winery now making 5,000 cases, that’s the way Paul Gardner likes it. “I would rather make small lots of interesting wine than big tanks full of wine,” Paul once told me. Pentâge Chardonnay Reserve 2007 ($20). Here is a wine for lovers of the mainstream California Chardonnay style, with no apologies for giving the wine as much oak as its rich fruit flavours can carry. There is citrus and butterscotch on the nose, followed by flavours of tangerine and butterscotch. The texture has a creamy weight and intensity. 90. Pentâge Gewürztraminer 2010 ($17.50). This is a textbook example of the dry, rich (almost oily) Alsace-inspired Gewürztraminer. The wine is intense from beginning to end – intense spice and citrus aromas, intense flavours of grapefruit and lychee. The lingering finish could be timed with a stopwatch. 91. Pentâge Sauvignon Blanc 2010 ($19.50). Crisp and zesty, this wine recalls the New Zealand style (which I happen to prefer). Beginning with grassy, citrus aromas, it has flavours of lime and grapefruit rind. It has a nice spine of minerals and the bright acidity wakes up the taste buds. 89. Pentâge Skaha White 2009 ($16). Here is a complex but budget-priced six grape blend: 41% Pinot Gris, 30% Chenin Blanc, 12% Viognier, 6% Chardonnay, 6% Riesling, 5% Sémillon. The 2010 blend, already being sold as bag-in-the-box, is significantly different in composition but I did not have a chance for a side-by-side comparison. The 2009 has stone fruits and citrus aromas, with flavours of cantaloupe, citrus and apricot. Its texture gives it good heft on the palate. 88. Pentâge Viognier 2009 ($19.50). The toasty aromas and flavours of apricots and pineapple, with an undertone of nuts, suggest that the wine may have been barrel-fermented. It is dry and even austere on its own but rich and delicious when paired with food (which is the point, after all). 90. Since its first vintage in 1997, Burrowing Owl Winery has had a remarkably consistent house style, most notable in the generous, mouth-filling flavours of its red wines. Part of that is due to terroir. The sandy vineyard here is one of the hottest in Canada. It is hard to imagine any place better suited to growing big, fleshy wines. The other explanation for the consistent style is the continuing influence of California winemaker Bill Dyer. Even though he left in 2004, the winery has not abandoned his winning formula, even through three successive winemakers. “If it is not broken, then do not fix it,” acknowledges Bertus Albertyn, the South African who has been the winemaker there since October, 2009. That is a refreshing absence of ego in a profession that usually is not short on ego. Bertus, who was born in 1978, has an enology degree from Stellenbosch University and a good wine pedigree. While his father was a bank manager, an uncle is a senior viticulturist at KWV, South Africa’s wine giant, and his grandfather was a grape grower. When Bertus finished wine school, he worked for a major co-operative and then, in 1994, he became the winemaker at a family winery called Avondale, which is about twice the size of Burrowing Owl. He came to the Okanagan early in 2009, having married childhood friend who now has a medical practice in Osoyoos. He spent much of that year working on the vineyard that Donald Triggs is developing. Triggs, the former chief executive of Vincor, is planning a winery in the south Okanagan. But since it is a few years down the road, Bertus joined Burrowing Owl to replace Jeff Del Nin, who was moving to Church & State. The current releases from Burrowing Owl include wines that Jeff made and Bertus saw into the bottle, as well as wines Bertus made entirely on his own. If there was a hick-up in the winemaking style, I have not come across it yet. Burrowing Owl Pinot Noir 2009 ($30 for a production of 1,086 cases). Pinot Noir were first grapes that Bertus dealt with when he joined Burrowing Owl just as the vintage was getting under way. The vintage produced ripe grapes full of flavour. This wine is dark in colour, with its 14.5% alcohol the result of the ripeness of the fruit. The wine has aromas of spice and black cherries. On the palate, there is more black cherry and red plum, with spice on the rich finish. This may be muscular compared with most Okanagan Pinot Noirs but it is tasty nonetheless. 89. Burrowing Owl Cabernet Sauvignon 2008 ($38 for a production of 1,456 cases). This would blow away a lot of California Cabernets. It begins with aromas of spice, cassis, mulberries and vanilla. On the rich palate, there are flavours of plum, fig, liquorice, with a dollop of sweet fruit on the mid-palate. This is a very generous and satisfying wine, without any note of greenness. 91. Burrowing Owl Meritage 2008 ($45 with a production of 969 cases). This is sold out at the wine shop and not available on line but it might be worth calling up a few high-end private stores. This is an elegant and complex blend: 50% Merlot, 24% Cabernet Franc, 24% Cabernet Sauvignon, and 1% each of Malbec and Petit Verdot. The alcohol is 14.9% but there is so much concentrated fruit here that you don’t notice the alcohol. It begins with brambly, spicy aromas of black currants and blackberries, with mineral and tobacco undertones. The flavours include currants, truffles and chocolates. The tannins are long and silky, reflecting both the ripeness of the grapes and the 22 months this wine spent in barrel. It is an impressive blend. 92. With the first harvest from its Lillooet vineyard expected this fall, Fort Berens Estate Winery has appointed a staff winemaker. Bill Pierson, who spent four years making wine with Tom DiBello at CedarCreek Estate Winery, anticipates that the Fort Berens vineyard will produce about 35 tons in its ground-breaking inaugural vintage. The vineyard was planted in 2009 by Rolf de Bruin and Heleen Pannekoek, two former Dutch bankers who emigrated to start a winery in British Columbia. Unable to find reasonably priced vineyard land in the Okanagan, they decided to take a gamble on the Fraser Canyon, encouraged by the results of recent small-scale grape growing trials in the Lillooet area. With consulting advice from Richard Cleave, a veteran Black Sage Road vineyard manager, Rolf and Heleen planted 20 acres of vines, a block large enough to prove (or disprove) the commercial viability of a vineyard in this area. Climate data indicates the vineyard gets as many heat units, if not more, than Oliver area vineyards. One challenge in the Fraser Canyon is finding vineyard sites that are not excessively shaded by the high mountains on either side of the canyon. The Fort Berens vineyard is on a plateau bathed by sunlight which falls through an enormous cleft in the mountain wall to the south. (The Duffy Lake Road to Pemberton goes through this pass.) Fort Berens has another 20 acres suitable for vines once the initial planting has proven itself. The varieties currently grown here are Pinot Noir, Merlot, Cabernet Franc, Pinot Gris, Chardonnay and Riesling. The winery’s two previous vintages were both made in an Okanagan winery with grapes primarily from Harry McWatters’s vineyard on Black Sage Road. The winery will continue to buy at least some Okanagan grapes in the future, to supplement its own production volumes and its selection of varietals. Bill will be make some of his 2011 wines in an Okanagan winery and the rest in a temporary facility at Fort Berens, which expects to begin construction next year on a 4,000-case Lillooet winery. This will be the third time that Bill has been involved in winery construction. Born in Montreal in 1956, Bill studied political science and geography but started his working career with Montreal Engineering in planning and costing projects. He worked on pulp mills and power plants in Ontario before moving to another engineering firm in Saskatoon. After a 1980s downturn in engineering, Bill who was a serious competitive runner, became a sales representative for Nike, first in Saskatchewan and then in Vancouver. When he and his wife, Julie, moved to Bowen Island in the late 1980s, he switched to residential construction with an architect and builder. “I got to 40 and thought, what am I going to do with my life?” he recalls. “Do I continue in building or so I look for something different?” He had been interested in wine since growing up with a wine-loving father. So he decided to take the wine programs offered by Okanagan University College. He eased out of the construction business, doing his practicum at Nichol Vineyards, then doing a few crushes in the Okanagan until, in 2004, he moved to the Okanagan. Initially, he helped plant the vineyard and build the winery for Township 7. Then he moved to Laughing Stock Vineyards in the summer of 2005, in time to help build that winery. In 2006 he joined CedarCreek, to work under the mentorship of Tom DiBello, then the senior winemaker there. Bill left CedarCreek in the fall of 2010. Tom is now a member of Harry McWatters’s The Vintage Consulting Group. When Tom was making the Fort Berens wines in 2010, he engaged Bill in the project and that led to the winery employing Bill as its winemaker. Mission Hill Family Estate Winery is one of the two largest owners of vineyards in the Okanagan, with properties from Kelowna to Osoyoos. This gives the winemaking team an enviable flavour palate to work with, with quality grapes that support a large and generally excellent portfolio. The wines are released in four tiers, beginning with the entry level tier, which is called Five Vineyards. Affordably priced, these wines are widely available in government and private wine stores. The Reserve tier wines are in much more limited distribution, but of sufficient volume that you might even find some in overseas markets. A further step up, the Select Lot Collection wines are produced in small volume and are available primarily at the winery and in top end restaurants. Current releases from these three tiers are reviewed here. The winery also has a fourth tier of ultra premium wines, called Legacy. At the very top of its wine pyramid is the flagship Bordeaux blend, Oculus. These wines have a different release cycle, spending more time in barrel and in bottle. Here are the notes on the current wines. Mission Hill Five Vineyards Rosé 2010 ($14.99). The winery notes don’t say it but this wine likely is the result of bleeding juice from the three varieties in the blend (a classic French technique). The wine is 70% Merlot, 20% Cabernet Franc and 10% Shiraz. It is a light, juicy rosé with aromas of cherries and raspberries and flavours of watermelon and wild strawberries. It is finished with just enough residual sugar (eight grams) to ensure it will be a crowd pleaser. 87. Mission Hill Five Vineyards Cabernet Merlot 2008 ($16.99) A good red from the winery’s entry-level range, this wine has soft ripe tannins, appealing brambly berry flavours, with an underlying hint of mint. The winery put a lot of work into this wine. The blend is 47% Merlot, 28% Cabernet Franc, 20% Cabernet Sauvignon and 5% Petit Verdot. The wine spent 13 ½ months in American and French oak. 87. Mission Hill Cabernet Sauvignon Reserve 2006 $N.A.) Here is an elegant and cerebral wine that reveals itself slowly with time in the decanter. It starts with mint and berry aromas, continuing to flavours of currants, plums, chocolate and tobacco, with a spicy note on the finish. This is no longer in the market. The point of reviewing it now is that, if you are lucky, you have some in the cellar. The current vintage is 2009 and if you give it five years as well, you will be well rewarded. 90. Mission Hill Pinot Gris Reserve 2009 ($18.99). About seven per cent of the wine was fermented in French oak, giving a biscuity note to the pear and citrus aromas and adding flesh to the texture. On the palate, there are flavours of pear and apple. Almost dry on the finish, this wine is elegantly balanced. 90. Mission Hill Pinot Noir Reserve 2009 ($24.99). In his 2004 book, North American Pinot Noir, author John Winthrop Haeger wrote that Mission Hill’s management “is at the point of trying to decide ‘whether to get really serious’ about pinot.” Too bad he is not around these days to taste the winery’s Pinot Noir. This wine, well priced for a Pinot, begins with a fine dark colour. It has aromas of cherries and raspberries, leading to flavours of cherry, red plum, spice and vanilla. It has a light backbone of tannin that, with decanting, begins to show the rich and silky texture of this varietal. 89. Mission Hill Viognier Reserve 2009 ($18). This unoaked white – Mission Hill’s second vintage of Viognier – begins with aromas of herbs, citrus and apricot. It tastes of apricots and peaches, finishing dry but with an impression of honey that shows off the complexity of well-made Viognier. 90. Mission Hill Select Lot Collection Merlot 2006 ($30) Kudos to Mission Hill for holding a red back almost five years before releasing it. Even at five years, the structure still was firm enough to hold the wine at its peak for another five years. Dark in colour and concentrated in texture, the wine begins with powerful black currant aromas, leading on to flavours of cassis and figs. The flavours are layered; as the wine sat in the glass over time, it revealed more and more layers. 92. Mission Hill Select Lot Collection Sauvignon Blanc Sémillon 2008 ($21.99). This wine, which is 79% Sauvignon Blanc and 21% Sémillon, involved exceeding complex winemaking and should probably sell for more. A portion of the wine was fermented in and aged sur lies in new French oak. The result is a rather cerebral wine, with aromas of oak, butter and citrus, with buttery tangerine and pineapple flavours and a rich texture. This is a wine I might pair with a good Cuban cigar. 88-90. Summerland’s newest winery, Heaven’s Gate Estate Winery, had its grand opening last week and that is good news for rosé lovers. Most of the other 10 members of the Bottleneck Drive Wine Route (the name for their promotional association) are running low on rosé. Heaven’s Gate still has some, but only because it took the winery a few extra months to jump through all the regulatory hoops before opening. In addition to the rosé, Heaven’s Gate opened with four other wines, all from the 2010 vintage. Available in the tasting room is a Merlot, a Gewürztraminer, a Sauvignon Blanc/Sémillon blend and Pinot Gris. I tasted the whites and the rosé from the tank this spring. The Gewürztraminer is a juicy, off-dry crowd pleaser. The Sauvignon Blanc/Sémillon had a honeyed not to the flavours. The rosé was dry and tasted of cherries; I am told that finished wine is not quite as dry. I was particularly impressed with the Pinot Gris with its intense aromas and flavours of lime and grapefruit. The wine is a 90 pointer in my book. The proprietors of Heaven’s Gate are Andy and Diane Sarglepp. Until 2008 they grew peaches, operating as Triple A Orchards. If peaches have a cult following, Triple A had such a reputation. Andy was born in Haney in 1965 and in adulthood began working in logging and sawmilling. His Estonian-born parents – his father had become a successful construction contractor in Canada after arriving impoverished after the war – bought this Summerland property about 25 years ago. Andy was asked to help develop the peach orchard. He fell in love with the Okanagan and stayed. He says he stopped eating peaches about 15 years ago. Diane says that peaches are not allowed in the house. The building formerly used as cool storage for peaches turned out to be well-suited for making and storing wines. For the wine shop, Andy and Diane have completed very elegant renovations to a log building that once served as summer accommodation for visiting friends and relatives. The tasting counter is Brazilian granite. A large mural and antique farming and logging tools decorate the interior walls. The patio in front includes a fountain and is bordered by rock work, some of it – along with the baronial pillars at the front gate - done by Andy’s late father. The view from the patio is a panorama of vines in the foreground and Okanagan Lake in the distance. “We want to keep our patio uncramped,” Andy says. “I have a big bird feeder there and I will sit here sometimes and just watch the little guys.” And they hope that visitors will take time for the same pleasure, with a glass of wine in hand. The grapes in the vineyard include two acres of Gewürztraminer, a variety very much at home in the Summerland terroir. Andy has also planted Merlot, Gamay and Sémillon; a planting of Sauvignon Blanc did not survive an early winter freeze. The vineyard’s first crop will be harvested this fall. To get started, Andy purchased grapes last year. With the help of consultant Christine Leroux, he made 13,000 litres (about 1,450 cases) in 2010, about two-thirds of it white. The volume of red is likely to be increased in subsequent vintages. 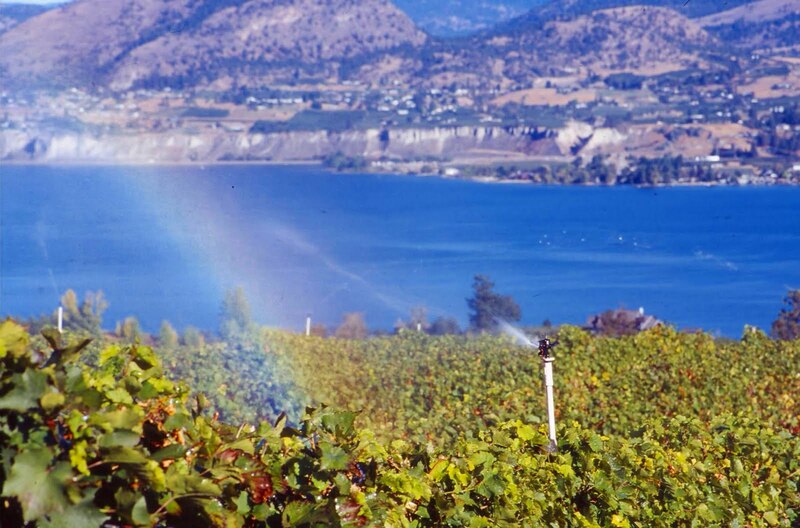 Vineyard acreage in British Columbia continues to rise, although the rate of growth has slowed significantly. This emerges from the most recent vineyard census, just released by consultants Lynn and John Bremmer, who operate Mount Kobau Wine Services in Oliver. The census is done with the backing of the B.C. Wine Institute and the B.C. Grape Growers. The 2011 census is the fifth since 1999. That census counted 1,693 hectares (4,184 acres of wine grapes). The 2011 census tallied 3,964 hectares (9,866.52 acres) in 2011.That compared with 3,626 hectares (9,066.32 acres) in 2008; and 2,653 hectares (6,632 acres) in grapes in 2006. They also surveyed planting intentions and projected that another 376.37 hectares (930 acres) could be planted in 2012 and 2013. The area under vines in British Columbia has experienced eight-fold growth in the past two decades, although the rate of increase is now slowing, largely due to a shortage of suitable sites. British Columbia’s vineyard area is still small compared with other regions. Ontario has about 6,070.5 hectares (15,000 acres) of vineyard; Washington State has 16,166 hectares (40,000 acres) and California has 261,514.5 hectares (535,000 acres). These are the regions the grapes grow. These are the mostly widely planted red varieties. Just over 52% of all the grapes are red. These are the most widely planted whites. Within the white varieties, Viognier plantings have increased 24% in the past three years, followed by a 19.6% increase in Riesling plantings and a 14.8% increase in Pinot Gris plantings. Decline acreage is reported for Sauvignon Blanc, due to winter kill. And sadly, that reliable workhorse, Pinot Blanc, has suffered a 28% acreage drop, likely because consumers consider it a bland variety. Among the reds, Cabernet Franc plantings rose 32.3%, followed by Pinot Noir (up 19.6%), Maréchal Foch (up 12.9%) and Cabernet Sauvignon (up 10.9%). Duncan McCowan, the Alberta geologist who first invested in Hillside Estate Winery in 1998, is back as winery president as well as chairman. A long-time chair, Duncan was the winery’s president from 2002 until 2005, before turning that post over to Bill Carpenter during one of the several restructurings that Hillside has been through. In July Duncan resumed the president’s role at the winery when Bill left in an apparent management shakeup. While this signals changes in Hillside’s operations, there will be no change in winemakers. Kathy Malone, who came to Hillside late in 2008 after a long career at Mission Hill, is highly regarded by her employers as she continues to raise the bar on wine quality. At a recent tasting, I found the new releases from Hillside among the best I have ever tasted at this winery. By bringing the focus back on Naramata grapes, Hillside is coming full circle. The first winery on Naramata Road when it opened in 1990, it began in a roadside farmhouse with a postage stamp vineyard planted by Czech immigrants Vera and Bohumir Klokocka. Hillside’s signature white wine, the Muscat Ottonel, was a variety planted here in the mid-1980s. One of Hillside’s best reds, the Old Vine Gamay, is from vines planted in 1984. After her husband’s death, Vera sold the winery in 1996 to Vintage Holdings, a Calgary company that over-extended its resources by building the current winery. In 1998 a group of investors – there eventually were 95 – took over Hillside. Hillside did a second restructuring in 2005, consolidating the ownership structure to 22 shareholders, including Bill Carpenter. Duncan McCowan was one of the 1998 investors when, while he was making a presentation about one of his junior oil companies to an investment banker, he was persuaded to invest in Hillside. “I have always just had a passion for the wine business and wine,” he says. “We’d have a board meeting and have to write cheques,” he recalls his early years with Hillside, when the winery needed cash infusions. “I think I wrote a few more cheques than some of the others and became a fairly significant shareholder of Hillside.” And eventually he became chair. Born in Calgary, Duncan has worked as a geologist since graduating from the University of Alberta in 1972. Currently, he runs McGowan Exploration Management, a consulting company and is chief executive of a private gas producer. He is also a director of Alberta Wind Energy Corp. “I am interested in all forms of energy,” he says. He suggests that there will not be major changes in Hillside’s future direction. But there will be some, including more focus on Naramata grapes along with the release of single vineyard wines, possibly the development of a second label and a paring down of the long portfolio. Hillside has made as much as 12,000 cases a year but has settled down to making between 9,000 and 10,000 cases annually. The current releases are beginning to reflect Kathy Malone’s hand in making the wine. She moved from the anonymity of Mission Hill’s big cellar to work in much smaller, hands-on winery. She took over from Kelly Symonds in time to finish the 2008 wines. Here are notes on some of the wines. Muscat Ottonel 2010 ($19.99 for a production of 1,084 cases). The classic aroma of this variety is like a bouquet of flowers. That adds to the appeal of this exquisite wine, with its delicate flavours of spice and citrus. The moderate alcohol of 12.7% underlines the delicate elegance of the wine. 91. Gewürztraminer 2010 ($18.90 for a production of 685 cases). Again low in alcohol (12.1%) and with a trace of residual sugar, this wine is light and elegant. It begins with aromas of spice and grapefruit and delivers flavours of lychee and grapefruit. 89. Pinot Gris Reserve 2009 (September release of 907 cases). This wine was fermented and aged primarily in Hungarian oak barrels and spent time on the lees. As a result, the wine has a rich, fleshy texture, with aromas of orange blossoms and flavours of peaches. There is a note of spice on the finish. The oak is handled very well; it does not submerge the fruit in this delicious wine. 90. Rosé 2010 ($18.99 for a production of 360 cases). This wine is based primarily on Merlot but also includes juice of Cabernet Sauvignon, Gamay Noir and Pinot Noir. The colour has an appealingly vibrant hue. The fruity aromas signal what comes next – luscious flavours of strawberry, cherry and cranberry. The finish is crisp and dry. 89. Old Vines Gamay Noir 2008 ($24.99 for a production of 650 cases). Think of a Beaujolais Cru, perhaps a Fleurie. This wine’s aroma of cherries and strawberries explodes from the glass. On the palate, it is juicy and appealing, with cherry and raspberry flavours. The texture is smooth and the finish is long. 91. Old Vines Gamay Noir 2009 (Not yet released). This tastes like a different Beaujolais Cru but I can’t put my finger on which one. It is a darker, more intense wine than the 2o08, with aromas of red berries and pepper. On the palate, the wine has a pleasant earthiness, with flavours of plums. 91. Merlot 2009 Hidden Valley Vineyard ($24.99 for a production of 190 cases). The Hidden Valley vineyard is tucked away in a valley above the winery (i.e., hidden from view). Something in the soil here gives this wine a note of graphite on the nose, along with the dark plum and fig flavours. The wine has good aging potential. 90. Merlot 2009 Taylor Vineyard ($24.99 for a production of 190 cases). This vineyard, with 15-year-old vines, is just below the winery. The aromas and flavours reflect quite a different terroir. The wine is concentrated, even meaty, in texture with savoury flavours of plum and fig and with a hint of chocolate. 91. Mosaic 2007 ($39.99 for a production of 750 cases). This is Hillside’s flagship Bordeaux blend, first created in 2002. Since 2006, the grapes have all been sourced on the Naramata Bench. The wine is 34% Merlot, 27% Cabernet Sauvignon, 23% Cabernet Franc, 13% Malbec and 3% Petit Verdot. The moderate alcohol, 12.5%, also recalls a classic Bordeaux style as opposed to the powerhouse Okanagan style. However, this is an elegant and complex red, with aromas of cedar and cassis and with flavours of currants. The wine has at least five years of cellaring ahead of it. 91. During the past three years, Quails’ Gate Estate Winery has enjoyed a remarkable string of invitations to provide wines visiting dignitaries. Most recently, six Quails’ Gate wines were served at a dinner in the Northwest Territories for Prince William and his bride, Catherine, the Duke and Duchess of Cambridge. Before that, Quails’ Gate wines were served to such guests of Canada as Queen Elizabeth, the Emperor and Empress of Japan, the president of Ireland and President Barack Obama. Perhaps it is just a coincidence that the Stewart family, owners of the winery, includes some who are federal Conservative supporters. The records would probably show that when the Liberals ran the country, the wines at state functions occasionally came from Senator Ross Fitzpatrick’s CedarCreek Estate Winery. It just happens that these are two of the best wineries in the Okanagan. I expect that our visitors and those dining with them came away quite impressed. It was not always like this. In the early 1980s, wines served at a dinner for the Queen included a Maréchal Foch (not from Quails’ Gate) so unstable that there fizzy bottles all over the room. That was then and this is now. The Duke and the Duchess had a chance to taste some of my favourite Quails’ Gate wines: the Stewart Family Reserve Pinot Noir, the Stewart Family Reserve Chardonnay, the Chenin Blanc, the Old Vines Foch Reserve, the Fortified Vintage Foch and the Totally Botrytis Affected Optima. Some of these I have reviewed before while others were included in the most recent group of samples. We can all drink like royalty. Here are notes on four recently-released wines. Quails’ Gate Stewart Family Reserve Chardonnay 2009 ($29.99 for a production of 1,100 six-bottle cases). The SFR wines are the top tier wines here. The grapes for this wine come from vines that are 13 to 17 years old and, therefore, deliver more flavour. This wine was barrel-fermented entirely in French oak barrels (40% new, the rest one year old). Consequently, the oak notes are very subtle and well integrated in this complex wine. The wine shows aromas of toast, butter and tangerine; and flavours of citrus and apricot with a touch of spice. While the wine went through malolactic fermentation, it still retains a crisp finish. 91. Quails’ Gate Pinot Noir 2009 ($25 for a production of 7,000 cases). 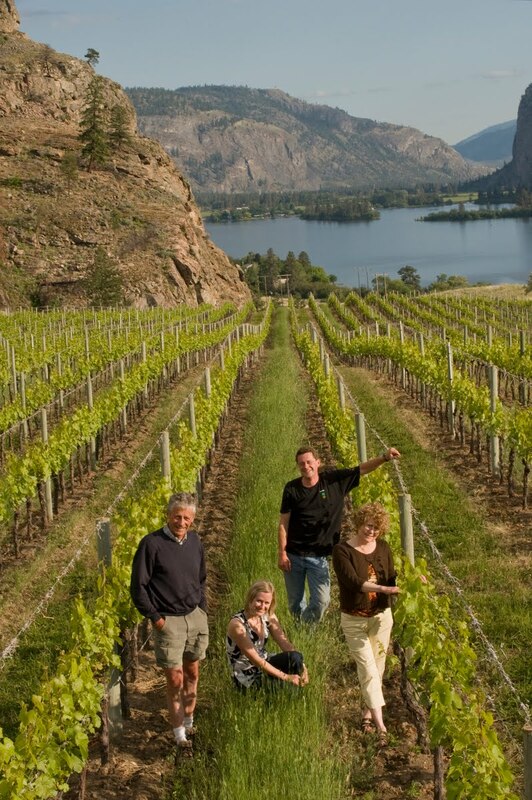 This winery probably has the single largest planting of Pinot Noir in the Okanagan; the Stewart family has been growing Pinot Noir since 1975. Their winemaker, Grant Stanley, is absolutely passionate about the variety and it shows. This wine, from a big, ripe vintage, is dark in colour with aromas of cherries. It is vibrant and rich on the palate, with notes of raspberry and cherry. The winery produced 7,000 cases. 89. Quails’ Gate Merlot 2008 ($24.99 for a production of 2,750 cases). When I read the label, I thought here is an Okanagan Merlot than thinks it is a Zinfandel: the stated alcohol is 15.5%. When a wine is as well-balanced as this ripe Merlot, you don’t notice the alcohol (at least not until it hits the knees!). Because the wine is bottled under a screw cap, I took pains to decant it and let it breath so that the youthful exuberance could evolve and give the idea of what the wine would taste like with cellaring. The winery recommends cellaring it up to seven years. It was a little firm on being first tasted, reflecting both its oak and its long, ripe tannins. Over the next hour or so (and with a steak), its rich, fleshy texture emerged, along with a core of sweet fruit – currants, plums, figs. If you are patient with this muscular red, you are well rewarded. 90. Quails’ Gate Totally Botrytis Affected Optima 2009 ($29.99 for a 375 ml bottle; production of 452 cases). 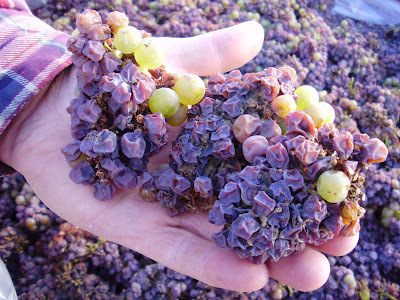 TBA wines are rare in the Okanagan because the climate usually is too dry to foster botrytis, the noble rot that raises the sugars and flavours of grapes by dehydrating grapes on the vine. The Quails’ Gate vineyard, not far from Okanagan Lake, has the microclimate for botrytis and a grape variety, Optima, which is susceptible to noble rot. The winery has been making dessert wines like this for close to 20 years. The grapes for this wine were actually crushed by foot. That is far more efficient that a mechanical crusher in making sure the juice of these shrivelled grapes is in contact with the skins. The wine was fermented slowly until the winemaker achieved the right balance between sugar, acidity and alcohol. This has 10% alcohol and 122 grams of residual sugar. The wine has a lemony gold colour, with honey and orange peel aromas and flavours of honeyed apricots. While the wine is sweet, it is beautifully balanced to finish with delicate fruit flavours that are not cloying. 88. As pleasant as this wine is now, I think it should be cellared for several years because TBA wines darken in colour and become more intense in flavour with age. Think of the difference between a young Sauternes and an old one. Sauternes, of course, are TBA wines. When a winery changes winemakers after a decade with a really skilled winemaker, there is always some apprehension until the new winemaker’s first wines are released. Winemaking at CedarCreek Estate Winery was taken over before the 2010 vintage by Darryl Brooker. He succeeded Tom DiBello, a University of California graduate who had been there since 2000. Judging from the winery’s first 2010s, CedarCreek remains in very good hands. The cool 2010 vintage was a challenging one, with bracing acidity. In the whites and the rosé wines, Darryl has handled the acidity very well. We wait with interest to see his touch with the reds. Darryl was born in Canberra in 1973. He developed an interest in wine while serving in the Australian Navy – where tours of duty included visits to wine regions around the world. He left the navy to get a wine science degree at Charles Sturt University and a graduate diploma in wine business from the University of Adelaide. He started his winemaking career in the vineyards at Mountadam Vineyards in the Barossa Valley and then spent four years at Villa Maria Estates Winery in New Zealand before moving to Ontario. He came to Canada in 2003 to supervise building and launching Flat Rock Cellars near Jordan. Flat Rock, a producer of Pinot Noir, Chardonnay and Riesling, is a leading edge Ontario winery with gravity-flow architecture designed for gentle handling of grapes. In 2005, Darryl became the winemaker at Hillebrand Estates Winery, Andrew Peller Ltd.’s premium boutique winery near Niagara-on-the-Lake. He has supervised the winemaking at Thirty Bench Winery, another boutique winery and a Riesling specialist that Peller bought several years ago. He moved to the CedarCreek cellar in May, 2010. As CedarCreek president Gordon Fitzpatrick explained, Darryl “set out to express more character in our white aromatics.” This involved longer and more gentle press cycles and cooler, slower fermentations. It was certainly not the easiest year in which to put a stamp on the wines. Nature did that by handing him the coolest year, and one of the latest, in a decade. The Pinot Gris, for example, was picked a month later in 2010 than it was in 2009. Here are notes on the Brooker wines released so far. This rosé is made from juice bled from Pinot Noir after five to seven days of cold-soaking on the skins. This is a common technique of having your cake and eating it. The juice drained from the tanks makes a lovely rosé while the juice that remains to ferment on the skins is darker and richer. This is a lovely wine for summer, beginning with an attractive rose petal hue; aromas and flavours of strawberry and cherry. The balance of sweet fruit and acidity is perfect, yielding a refreshing finish. 89. CedarCreek Riesling 2010 ($17.90 for a production of 1,650 cases). 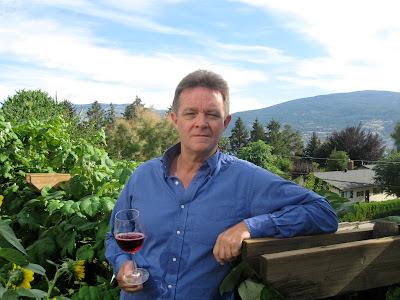 Darryl had plenty of experience making good Riesling wines in Ontario. It shows with this wine, one the Okanagan’s best 2010 Rieslings. Perhaps it was the year, but the technical specifications are markedly different from the 2009 Riesling. That wine, from grapes picked in mid-October, ended up with 7.9 grams of acid and 7. 54 grams of residual sugar per litre; and was fermented to 13.7% alcohol. The numbers for the 2010 wine are nothing short of astonishing. It is finished with an acidity of 12.2 grams, almost enough to scour the enamel from your teeth. What makes this wine work is the brilliant balance: it also has 16.5 grams of residual sugar and 11.3% alcohol. This gives the wine delicate weight on the palate and recalls some fine German Rieslings I have tasted. The fresh lime flavours are savoury on the palate. The finish, thanks to the balance, seems almost dry. 91. CedarCreek Ehrenfelser 2010 ($18.90 for a production of 1,158 cases). Since the 2002 vintage, when the winery vastly improved how the grapes were being grown, this has become CedarCreek’s cult wine. Chances are that Darryl had never had to make Ehrenfelser before; not many wineries anywhere make it. The grape was developed years ago in Germany and is named after a lovely ruined castle beside the Rhine. This wine, which some argue may be the best of the world’s limited numbers of Ehrenfelser, is dramatic as ever. It is a bowl of fruit, mostly apricots, in the bottle. The acidity is higher – 11.3 grams in the 2010 versus 7.25 grams in the 2009 – but the residual sugar is similar. As a result, the 2010 seems drier on the finish than the 2009. 89. CedarCreek Pinot Gris 2010 ($17.90 for a production of 4,150 cases). The winemakers at CedarCreek have always sought to bring a little complexity to Pinot Gris by fermenting a modest portion in barrel. Darryl added a further tweak to the 2010 by including 12% Chardonnay in the blend and leaving in 7.9 grams of residual sugar, balancing 8.92 grams of acidity. The 2009 Pinot Gris, by comparison, had 7.1 grams of acidity and negligible residual sugar. I no longer remember the precise taste of the 2009 Pinot Gris – obviously, it was dry- but I can say that the 2010 is delicious, with aromas of apples and pears and flavours of peaches. It is at the same time full on the palate and crisp on the finish. 91. CedarCreek Gewürztraminer 2010 ($17.90 for a production of 1,369 cases). Here is a warning to Gewürztraminer lovers: CedarCreek made only half as much Gewürz in 2010 as in 2009. This wine has the classic bouquet of rose petals and spice. On the palate, it has almost the oily richness and spiciness of an Alsace Gewürz rather than the core of sweet lychee fruit that some rival Okanagan Gewürztraminers show. 88. Recently, I dipped into my cellar for a bottle of Blue Mountain Pinot Noir 2006. It was a delicious bottle, richer than I recall it being when young. At five years, the wine is at its peak but has the texture to hold for several more years, and probably longer in cellars with ideal temperature control. Until this year, when my cellar was getting too full compared with the declining consumption at my dinner parties, I bought at least half a case annually of Blue Mountain Pinot Noir on release. On several occasions, I have shared verticals of the wine. (What is the point of collecting wine if you don’t share it?) You could always count on a good turnout for a vertical tasting because of the perception that Blue Mountain wines were hard to get. There was something to that. To make sure of a chance to buy the wines, you needed to have your name on what was called Jane’s List. It was named for Jane Mavety, a founder of the winery with her husband Ian. As the winery’s marketer, she allocated the wines to customers. In the years when Blue Mountain Vineyard & Cellars – now in its 20th year - was arguably the best winery in British Columbia, the wines sold out quickly. The limited production reserve wines still sell out quickly; you certainly need to be on the list. A lean family business, Blue Mountain opened its tasting room only a few times a year. For the most part, visitors needed to make an appointment to ensure someone was around to receive them. Occasionally, visitors without appointments were turned away. When a forest fire was contained at the edge of the Blue Mountain vineyard in 2003, some industry wag quickly cracked that the fire did not have an appointment. That policy changed yesterday. The winery announced that it will open its tasting room from 11 a.m. to 5 p.m. Monday through Saturday from May through early October. Times have changed. When Blue Mountain opened in 1992, there were about 25 wineries in British Columbia. With rare exceptions, Blue Mountain for many years never had to sell its wines through any private wine stores, much less the Liquor Distribution Branch. Today, there are about 225 producers and they are all fighting for business. Blue Mountain began making its wines accessible in private stores about five years ago. When the wines first went on the floor at Everything Wine, there was an actual buying frenzy until pent-up demand was satisfied. Blue Mountain’s wines still are consistently high in quality. However, there are plenty of other superb wine producers and they all have tasting rooms. Now that wine tourism is significant in the Okanagan, Blue Mountain has been foregoing its easiest sales by not having regular tasting room hours. There is another generation sharing the work with Ian and Jane. Matt, their son, is the winemaker and shares his father’s passion for growing grapes. Christie, their daughter, has become the winery’s sales and marketing manager. We’ll all drink to that.